Travelling through Neroche now, I clearly see the end of my project. I've lost the desire to follow up new threads - I like the thought of things being left suspended (and the paid artists days have expired - way over my budget now). But there is definitely one thing to follow up - the woman that Meg and I talked with over the gate about her animals. I shot a bit of video on my camera that day that I've wanted to put either on this blog, or on the website, and I want to ask her permission. Our conversation that day was very striking to both me and Megan, and I couldn't ask her on the spot whether I could use the video I'd spontaneously captured - that would have felt too 'breaking into' the presentness of the moment, too artist-needy. 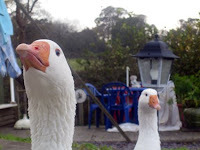 (Here is the post where I wrote about our encounter - scroll down to the geese). I have driven back past her house at least once, and paused - how to re-approach someone that you've engaged with spontaneously? - how would I react if I was her? - what is this desire to 'share' what she has said? So Meg and I have arranged to meet in Culmstock, and go back to her house; I like this collaborative task. We wander gingerly round the boundary - the geese are out and protective. There's a garden gate, some windows open ajar, but no-one responding. Then a young woman arrives who's looking for 'Kathy' herself (we didn't even know her name), so we wait for her to make contact. She goes fearlessly through the goose gate. Kathy appears, invites us in with no hesitation, remembering us from our conversation back in September. 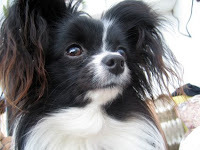 We sit in the conservatory with Pipsqueak the woof, the geese looking in through the window, beside cages for injured wild birds and talk about animal connection. It's good to come back to this conversation, to hear more about Kathy's life, her decision to devote her life to animals. Of course, use the video Kathy says. I promise to send her a copy along with the photographs that I've taken - these exchanges are important to me, and perhaps the most lasting aspect of any arts project like this. "To come into conversation can be a disturbing thing, exposing, altering and aesthetic. How the conversation is made can conduct the speakers in a unknown direction, towards friendship, argument, silence, the emergence of something new." We leave with an open invitation to return, and right now I want to make a three part art documentary about women working with animals in Neroche, and Kathy would certainly be the focus of one of the parts. I've been making work as part of a project connecting art, people and landscape, run by the Neroche Scheme in the Blackdown Hills on the Somerset/Devon. 'Revealing the landscape' is a Somerset Art Works project funded by ACE. This blog is the collecting and processing place for my work which has been tracking things passing through Neroche: migratory species, weather, water, flight paths, satellites, people, ideas, ghosts, geological movement, seeds.